You were one of those people who always wondered what the huge fuss was about with pregnancy announcements and wrapping that pee-infested stick in wrapping paper for your significant other to see. Until you started trying and realised that it could actually be hard to get pregnant and the anticipation and anxiety are real. On the other hand, you and your partner could’ve just stuck to your old ways and decided that it was too soon for you guys to have a baby, in which case, you needed to extra careful. In either case, what you need is one of the best pregnancy apps by your side so you can track your fertile days, among other things, and encourage or avoid a pregnancy! And if you are already pregnant? Well, once you have had time to get past the excitement and the thrill of finding out you’re going to be a mother, it’s time to spring into action. There are things to do, arrangements to make, problems to deal with. Your life is about to take a 180-degree turn and you need to be prepared. But if I learned one thing during my pregnancy, it was that good planning, the utmost knowledge about EVERYTHING that may come your way, and being prepared for it way in advance is what gets you through it. Again, that is where pregnancy apps, the resources they offer, and the community support you receive from them,come into the picture. In this blog post, we will discuss some of the best apps that you can install on your phone and keep track of your cycle, understand your body better, have access to top-notch resources, and be part of a close-knit community so that you have all the knowledge and support you need to get pregnant and ensure the journey goes smoothly from there on. This app is just what the name says – it’s your best friend when it comes to tracking your ovulation calendar and hence your fertility. It helps you identify your fertility window and make conception a greater possibility. The fertile window can be determined by making use of your fertility signs. What this app does it that it analyses your data and gives you an interpretation of these signs so that you can get pregnant more easily. It maintains an ovulation calendar that is as accurate as it gets. It is also colour-coded so you get all the information you need with a single glance. The app provides you with an in-depth analysis of your data and empowers you because it helps you get to know your body better. It makes you part of a community so you don’t feel alone. You can share advice, ask questions, help others, and so on. It ensures your privacy above all else – your data will not be shared with any advertisers. Extensive resources allow you to gain more knowledge into the subject. Overall, this is a great pregnancy app that helps you understand your body better and act accordingly so you can conceive with ease. Glow isn’t just an app that helps you get pregnant – it is much more than that. You can get information regarding your period cycle, ovulation, fertility, and much more about your pregnancy that helps you have a smooth journey. It maintains a fertility calendar for you that is accurate and effective. An ovulation tracker and period calculator are part of the entire process. With daily health updates, you can log as much as 40 different health signals ranging from sexual activity to PMS and much more – this helps you get pregnant more quickly. It transforms your data into insights that you can then use to understand your body better. It allows your partner to get involved in the journey which is, no doubt, an emotional one and you need all the support that you can get. The library of fertility FAQs makes sure all your questions are answered because someone, somewhere has asked them before. The app allows you to become part of a community so you can share and receive advice. Glow claims to be the only app that also tracks mail fertility. Offering all this and much more, this is a great app! The calendar and fertility chart helps you get pregnant with ease. This app tracks your data, including your BBT, cervical fluid, & much more to form a maximum of 50 custom fields. You can then use this data to always be aware of changes that are taking place in your body. By charting your data, you begin to start understanding your body better and that is always a comfort. You get to become part of Kindara’s community and learn so much more than what books and articles can teach you – you get firsthand advice and sincere answers from those who are in the same boat as you are. It provides you with the tools and resources you need to have all your questions answered. It gives you up-to-date information about your growing baby, as well as about your health. One thing that makes it stand out is that it provides award-winning 3D models of the different stages of fetal development. Because of this, you get to see what your baby looks like at every moment. 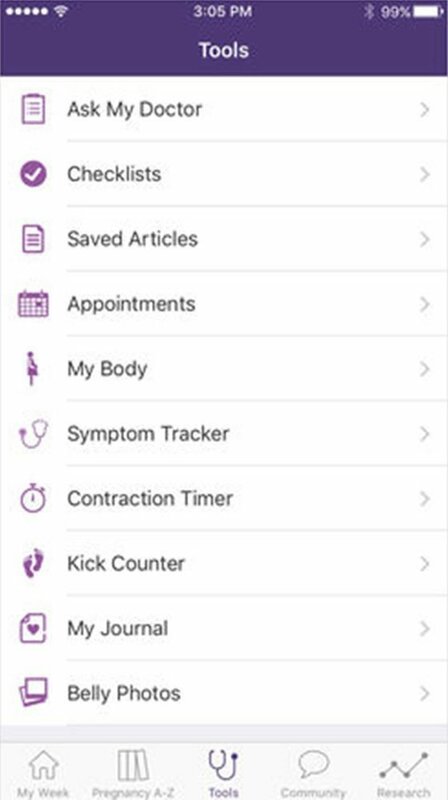 You get various pregnancy tools, including a weight tracker, kick counter, and contraction timer so you are prepared for anything. You can maintain a pregnancy journal with all your top memories. Create checklists that will keep you on top of everything at all times. 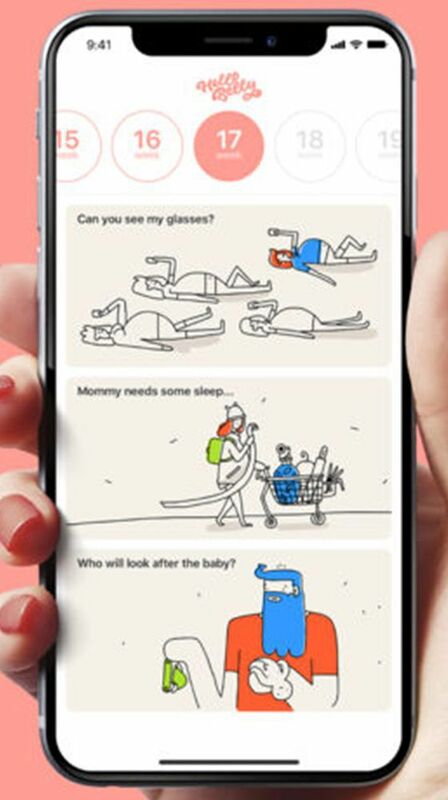 This is one of the best apps for pregnant women – do give it a try. You get to witness your baby’s growth and development in the form of hyper-realistic 3D videos. Because of the ample amount of resources at your disposal, you can keep yourself up to date with everything you need to know at every stage. Prenatal classes can be a pain to get to – we’ve all been there. But with this app, you can just take them from the comfort of your home. You can write your birth journal and set up your baby registry among many other things. Get expert advice on pretty much anything related to your pregnancy and the baby you are expecting. 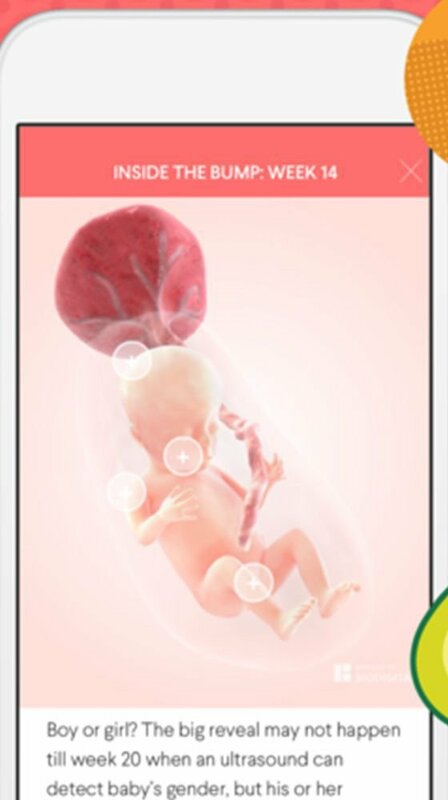 This is one of the top pregnancy apps (for iPhone) to stay on top of your pregnancy. You’ve found out that you are pregnant and you are overjoyed but you have also found out along the way just how very forgetful you are. And that is not the best thing to be enlightened about when you have a tonne of things to do and even more doctor visits to plan…and remember! 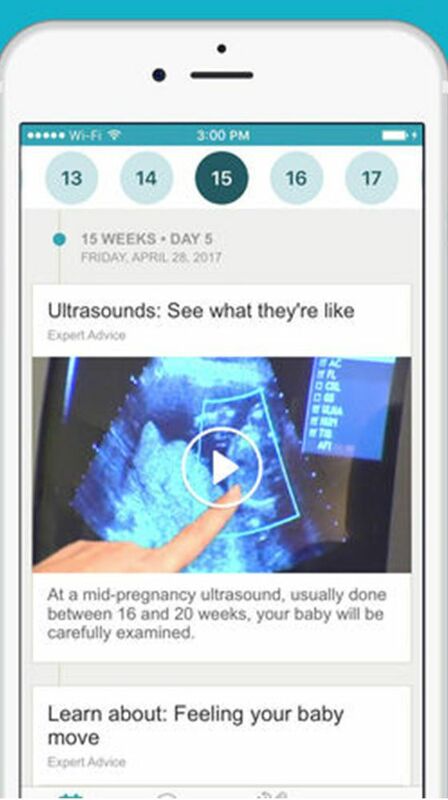 Enter ‘The Bump Pregnancy Countdown,’ the app you didn’t know you needed. Let’s look into just what it does for you. With an advanced planner, you can note down and remember every doctor’s appointment so you and your baby remain healthy and happy. 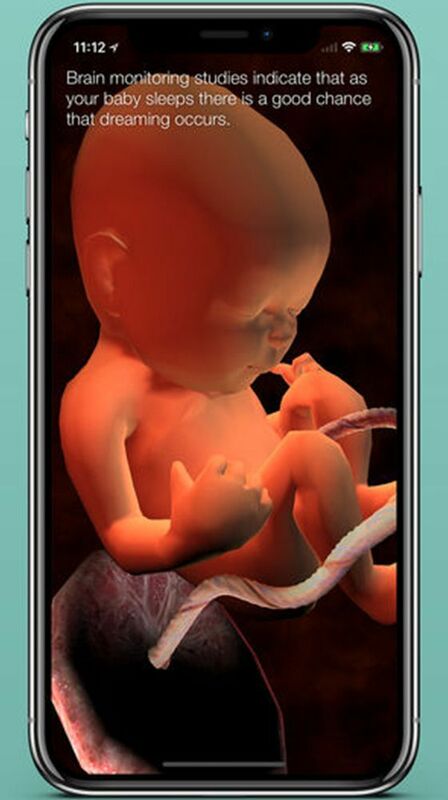 3D visualisations of what the baby looks like are the rage and this app lets you keep up with the rest of the world in seeing what their baby looks like at every stage. Information is key during a pregnancy, especially the right kind of information. This app provides you with award-winning articles. Get all your questions answered in a jiffy. A major issue during your pregnancy is buying the right products for your baby. This app allows you to check catalogues and reviews for everything you need. 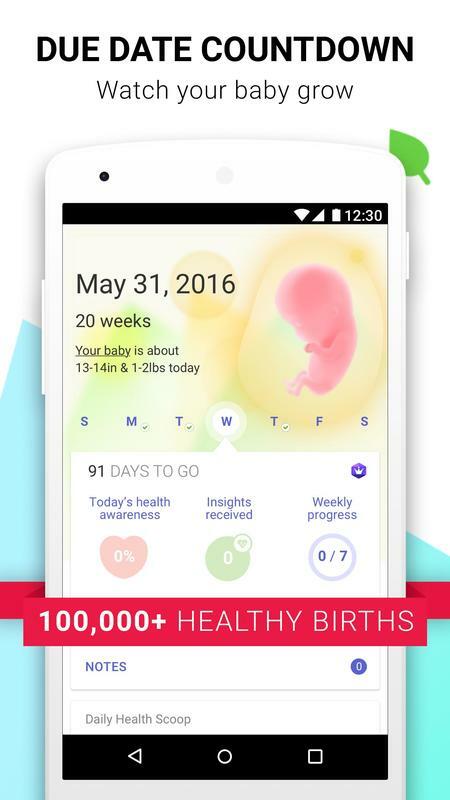 A great way to keep track of everything during your pregnancy, this app is a must-try. The WebMD pregnancy tracker and health guide does just that – it tracks the progress of the pregnancy, as well as the growth of the baby, and makes sure that both the baby and the mother remain healthy. Here are some of the things you get to enjoy with the app. Having a week by week progress report of sorts when you are pregnant can be the biggest blessing because you are concerned about the well-being of the baby – you get just that with this app. Checklists allow you to keep track of your to-do’s, as well as your appointments among other things. Belly photos are a must and the app gives you a place to store them. It also acts as a journal where you can document the journey and make notes. When you are expecting, you don’t want to make any mistakes or do anything wrong. The app makes sure you have access to all the top tips and insights that help you remain healthy. You become part of a community and can share your experiences while also benefiting from those of others. A symptom tracker, weight and blood pressure tracker, kick counter, and contraction timer helps you keep an eye on the baby’s health, as well as your own. A great number of features makes this app one of the best choices for you. Track your baby’s progress on a weekly basis. On top of that, get 3D visualisations of what he or she looks like at every stage so you miss out on nothing. You get guided onto the right path about everything related to your health, even things like what you should be eating. You get access to a baby due date calculator by the date of conception. You can create very important checklists to do with your nutrition, your shopping list, and so on. Meditation and yoga classes are a massive plus when it comes to this app as they keep you healthy, physically and mentally. Not only does it guide you through your pregnancy, this app also has you equipped for the first six months after you have given birth. Privacy is guaranteed when it comes to your data stored on this app. With extensive features, this app is a must-try. Watching your baby grow into a toddler and then into a wonderful little human being is one of the greatest joys of life. But what if you could do that even before your child is born? This app lets you just do that and much more. Let’s look at all its features in a little more detail. You can check the progress of your baby’s growth every single day, making sure you miss nothing. This includes hand and foot size, baby size comparisons, and much more. You get to carry out a countdown to your due date so that you keep on track and get everything done on time. With the top resources, you can ace your pregnancy, as well as the first few months of your baby’s life. This app gives you access to a multitude of articles and blog posts with tips you didn’t even know you needed. You can track your health and get instantaneous feedback. With weekly videos that give you the support you may lack at times, this app is the shoulder you need when things get hard. You become a part of a community of women going through the same thing you are. And honestly, there is nothing more comforting than that. 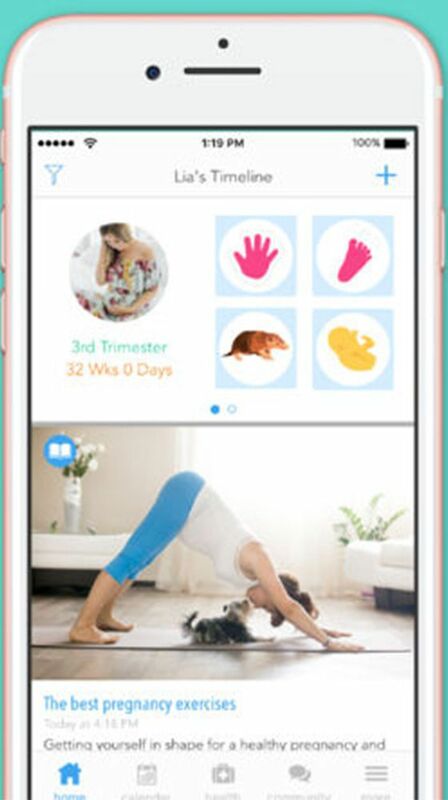 Track your baby’s exact progress at every moment among other things with one of the best pregnancy tracking apps! The app features an ovulation calculator that helps you get pregnant. With a pregnancy tracker and a calendar that monitors that development of your baby at all stages, you are covered from all angles. You can get resources in the form of articles and videos but what is different about them? They will be relevant to the particular stage of the pregnancy you are at according to your calendar. You get a daily feed, which includes ideas about what you should be eating, the exercises you should be doing, how to deal with any symptoms you may be experiencing, and much more. You can keep weekly checklists and reminders so that you are always on top of the game. Additional features include a baby kick counter, contraction timer, baby names finder, and birth plan checklist. All these facilitate you in the best way possible. Become part of a community for support and love. But that’s not all, once your pregnancy journey is over, the app takes you on the parenting journey with advice and a growth tracker among many other things. Helpful during pregnancy, as well as after, this app may just be the one for you. Now the question is, what is the best pregnancy app that provides you with all-in-one functionality? Well, we recommend the Babycenter Pregnancy Tracker & Baby App! Here are a couple of reasons why. 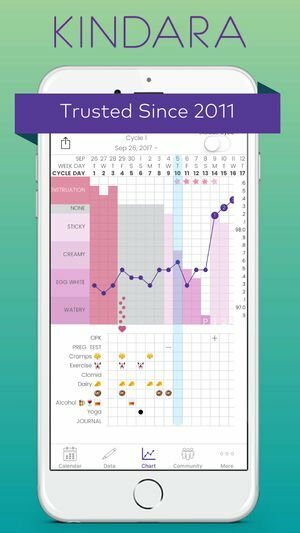 This app offers everything – from ovulation calendars for when you are trying to get pregnant to resources in form of articles and videos during your pregnancy and the best information and advice for your baby’s first year! You are basically covered at every stage of the journey. The app is free of cost. This is a great pregnancy app for android and iOS. So give it a try and be pleasantly surprised – this is probably the best free pregnancy app you will ever come across! I'm Catherine Nichol, a Blogger from New York United States. I'm a mother of two beautiful kids. I teach fiction writing and provide editorial services to aspiring writers. The idea of 10Babythings is to Provide you with honest reviews of baby essential products.